Roughly three years after the debut of the second airline member of the Viva Group, VivaColombia, Costa Rica has emerged as the base for the third airline VivaCam. The new airline is initially focusing on low cost service to Central America, which has little LCC penetration. Economies in that region are also stronger than most countries in South America, which means that residents in the region are more readily incentivised and able to travel. The establishment of VivaCam is another step towards the Viva Group establishing itself as a pan-Latin American LCC entity after injecting LCC competition into Mexico and Colombia with the establishment of VivaAerobus and VivaColombia. However, the current Viva airlines have no coordination, and it is uncertain whether VivaCam will initially seek to cooperate with its sister airlines. However, VivaCam will source aircraft from other Viva airlines. VivaAerobus placed a hefty Airbus narrowbody order in 2013, which will no doubt serve as resource for growth among all the Viva airlines, whatever growth trajectory each airline adopts. The Viva Group – owned by Irelandia Aviation and Mexican bus company IAMSA – established VivaAerobus in Mexico during 2006. Around that time LCCs Interjet and Volaris also launched operations, and all three airlines had the same broad goal to stimulate traffic in the market that was largely dominated by Aeromexico and Mexicana. 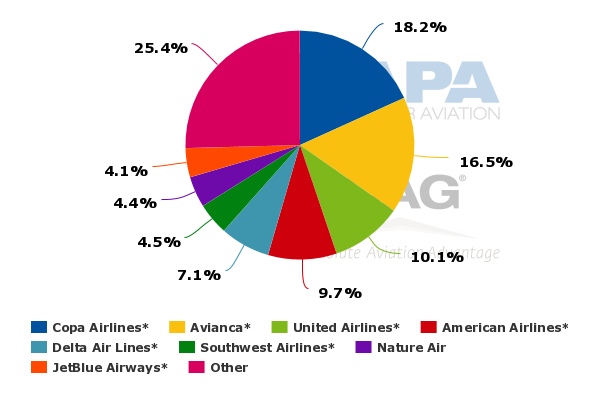 After Mexicana’s collapse in 2011, those LCCs worked to fill the void, and for the time period spanning Jan-2015 to Sep-2015 Volaris and Interjet each held a 25% domestic market share behind Grupo Aeromexico’s 34% share. VivaAerobus held a 12% share. The trailing of VivaAerobus with respect to market share has been an entrenched trend for the last few years. Part of the reason for VivaAerobus’ smaller market share is the airline is in the midst of its fleet transition to Airbus narrowbodies, currently operating 10 A320s and 13 Boeing 737-300 Classics (according to CAPA’s Fleet Database). Volaris and Interjet are much larger in scale, operating 55 and 57 aircraft, respectively. VivaColombia made its debut in 2012 and has progressively built up to a fleet of eight Airbus A320s. It is the only true LCC operating within the Colombian domestic market, which is dominated by Avianca and LAN. It has carried roughly seven million passengers during the last three years, and still largely focuses on domestic operations. Its international routes include Bogota to Lima, Panama City Pacific International airport and Quito. VivaAerobus made a US transborder push beginning in late 2014 and into 2015, but has axed six US routes it launched during the past year. In mid-2015 new reports surfaced that the Viva Group aimed to launch its third airline in Costa Rica by YE2015 with two A320s initially focussing on flights to Central America. As 2015 draws to a close, it is likely that VivaCam will make in fact its debut in 2016 as it works to attain all the necessary approvals for launch. At one point the Viva Group was considering establishing its third airline in Peru, another market with low LCC penetration, but has settled on Costa Rica, whose economy is a relatively bright spot in South and Central America. Costa Rica’s projected GDP growth in 2015 is approximately 3.5%, which is more favourable than contractions in Brazil and Argentina and in line with 3% projected growth estimates for Colombia, and Peru. The GDP of Chile is forecast to grow 2% to 2.5% in 2015. Chile is another market in South America that has little LCC penetration, but the country’s second largest airline Sky is working to transition to a LCC model. Costa Rica seems ripe for LCC penetration. 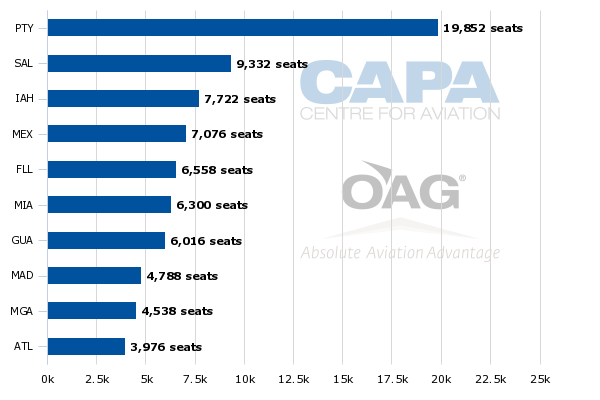 Roughly 14% of its international seats are operated by LCCs, and those are mostly US airlines. In addition to flights offered by the large US global network airlines, Frontier, JetBlue, Southwest, Spirit and Sun Country all operate service to Costa Rica. Canadian low cost airline WestJet serves the country and Mexican LCCs Volaris and Interjet also operate flights to Costa Rica. The Costa Rican market has experienced some changes over the last couple of years after Avianca closed its hub in the country during 2013. It inherited the hub at San Jose Juan Santamaria international airport after its merger with TACA in 2009. Among the airlines in the TACA Group was its Costa Rican subsidiary LACSA. 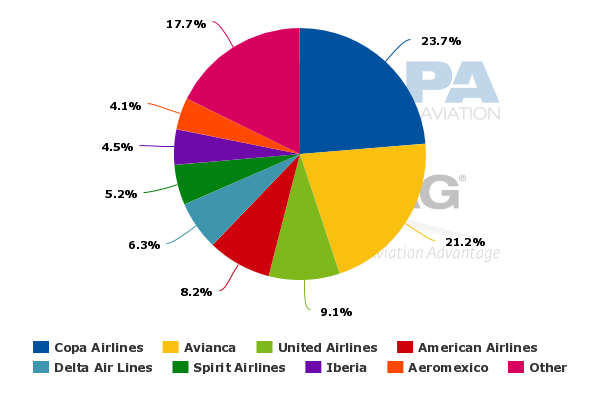 Presently (9-Nov-2015 to 15-Nov-2015), Copa represents 18% of Costa Rica’s system wide seats on offer and Avianca holds a nearly 17% share. At the country’s largest airport in San Jose, Copa holds a nearly 22% share and Avianca represents a 19% share. 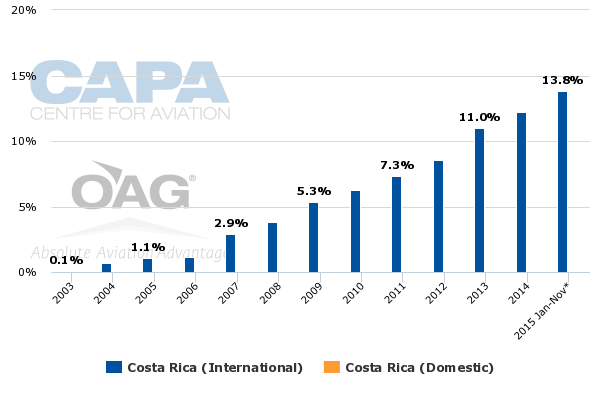 The data show that Costa Rica is clearly dominated by two of Latin America’s largest full service airlines, which coupled with the country’s economic prospects, indicate stimulative opportunities exist for a low cost airline. The same concept of LCCs courting bus traffic with low fares is applicable to Central America, where in some cases travel by automobile can be dangerous, not solely for geographic reasons. VivaCam has not yet unveiled its initial routes other than indicating it would operate service to Central America in the first phase of its operations. Routes from Costa Rica to Central America are dominated by full service airlines. 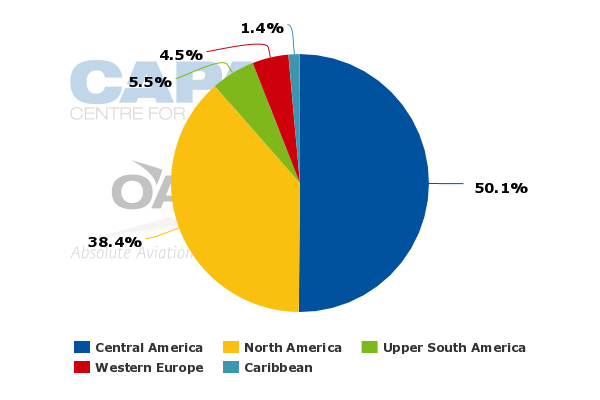 Data from CAPA and OAG for the week of 9-Nov-2015 show Copa holds the largest one-way seat share of 47% followed by Avianca’s 32%. LCCs Interjet and Volaris have shares of 5% and 2.6%, respectively. All the data point to a ripe opportunity for a LCC based in the heart of Central America. Presently, 50% of San Jose’s seats are deployed to Central America, and of the airport’s top 10 routes measured by seats, five are in the region. Among the top international routes from San Jose to Central America, only one is served by a LCC, Interjet’s flights from Mexico City Juarez. Aeromexico also serves that route. Avianca and Copa serve Panama City, Avianca and Costa Rican airline Nature Air operate flights to Managua and Avianca is the sole airline operating to San Salvador. LCC Volaris has also entered the Costa Rican market in 2015, introducing flights from Cancun and Guatemala to San Jose. VivaCam is headed by Joseph Mohan, a former Copa executive. Obviously Mr Mohan has vast knowledge of the Central American market, and which routes hold the most promise for LCC penetration; but most of the largest routes in the region seem like viable candidates. It is likely a safe assumption that cooperation between VivaCam and the other two Viva Group airlines will be scant during VivaCam’s first phase of operations. There is zero coordination between VivaAerobus and VivaColombia, even though full service airlines Aeromexico and Avianca combined account for 66% of the seats on offer between the two countries for the week of 9-Nov-2015. The lack of network cooperation is the most opaque facet of the Viva Group strategy. Obviously there were plenty of opportunities to stimulate traffic in the Mexican and Colombian domestic markets, but VivaCam could benefit from VivaAerobus’ presence in Mexico, creating an ability to offer cheap fares to and within Latin America’s second largest aviation market. Mexico’s domestic market is undergoing a slow recovery, with yields starting to gain some traction. VivaCam may wait until the recovery speeds up to plot a course to coordinate with VivaAerobus. Similarly, Avianca is the only airline operating between Costa Rica and Colombia, which again seems like a ripe opportunity for a low cost airline to stimulate traffic. But again, the Viva Group may be waiting for overall economic conditions to improve in South America before forging coordination among the three airlines. It may also be a matter of retaining the "purity" of the LCC model, by keeping complexity to an absolute minimum. What is obvious is that the 52 aircraft order VivaAerobus placed with Airbus in 2013 will be used to support VivaCam’s launch and growth. Placing some of the aircraft with VivaCam is a logical decision as conditions in Mexico only progressively improve, and Colombia’s GDP has been revised downward to 3% from an initial estimate of 4.5%. Establishing a third airline is a key movement in Viva Group’s strategy to create more low cost options in Latin and Central America. Just how wide the Viva Group’s reach will become is unknown. Much of Latin and Central America remain untouched by a LCC presence, but establishing a stand alone LCC in those regions is no doubt challenging. Costa Rica’s domestic market is small – only 9% of its seats are deployed on domestic operations. As VivaCam works to spread the Viva brand across the region, promoting the comprehensive network benefits of its sister airlines could prove advantageous. But that does not appear to be the strategy, at least so long as the individual operations are being bedded down.